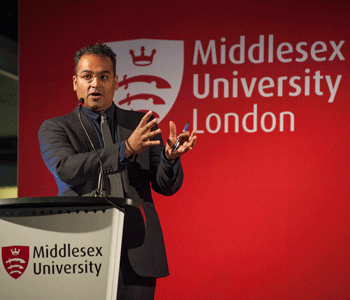 Channel 4 News anchor and renowned journalist Krishnan Guru-Murthy gave students at Middlesex University an exclusive insight into how to shape a media career, at a keynote presentation and exclusive interview on Tuesday 27 January. Speaking to an audience of 300 in the University's Rickett Quadrangle, Liverpool-born Krishnan spoke of his 25-year career in journalism and gave advice to students on how to break into the industry. Having started his career at 18, presenting youth television for the BBC whilst also fitting in a degree, Krishnan moved to Channel 4 News in 1998, where he remains as one of the main anchors alongside Jon Snow. He has covered a series of high profile events ranging from the Charlie Hebdo Paris attacks earlier this year, to the Omagh bombing, 9/11, as well as special war coverage and upcoming general elections. Ahead of his presentation Krishnan sat down for an exclusive interview with Middlesex, where he spoke of the changing media landscape and the vital skills aspiring journalists need to build their own careers in the industry. He also spoke of his passion for what he describes as "one of the best jobs in the world." "You enjoy an intimacy with people's lives that you just wouldn't doing anything else," he said. "In terms of your opportunity to see the world, experience the world, try and understand other people's problems, hold people to account, it's a fantastically privileged thing to do and so thoroughly worthwhile. I would recommend it to anyone."